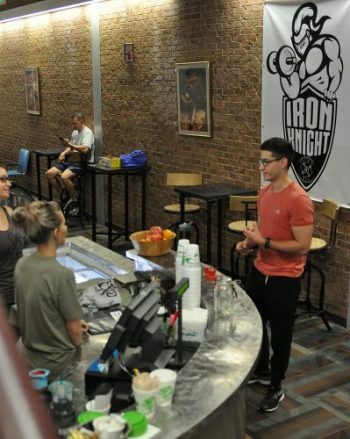 The Iron Knight is the cool new protein bar located in the Fitness Center. Iron Knight’s hours are 9 a.m.-5 p.m. Monday – Friday. Enjoy tasty, made-on-the-spot protein shakes! Get other great healthful snacks, too, like fresh fruit, yogurt, nutrition bars and beverages to go. Beverages include: Red Bull, Monster, Gatorade, San Pellegrino, coffee, juices and sodas.